Lewis G Robinson spent his life trying to improve his beloved West Chazy in every possible way. He always was ready with his moral and financial support of every local enterprise. Areas such as sport teams, fraternal and social organizations and all the churches of the village received some type of support from Mr. Robinson. Down through the years, he befriended and encouraged the Boy Scouts, the 4H Club and the Little League teams of the village and he many times spoke about ﻿the need of a sports field and meeting place for these and other local groups. Above all else, it was well known that the West Chazy Fire Department held first place in his heart from its very inception in 1932.In the winter of 1931, Lewis brother, William H Robinson lost his house and all his personal possessions in a disastrous fire which occurred while he was in Florida. At that time this was considered to be the greatest fire loss in the Village of West Chazy in many years. Spurred into action by that fire, a group of citizens that year petitioned the town board to establish a Fire District in West Chazy; one of the first in Clinton County. In 1932 the petition was granted and the West Chazy Fire District was formed with Mr. Robinson among the first five fire commissioners. He also consented to be the first Chief of the West Chazy Fire District. 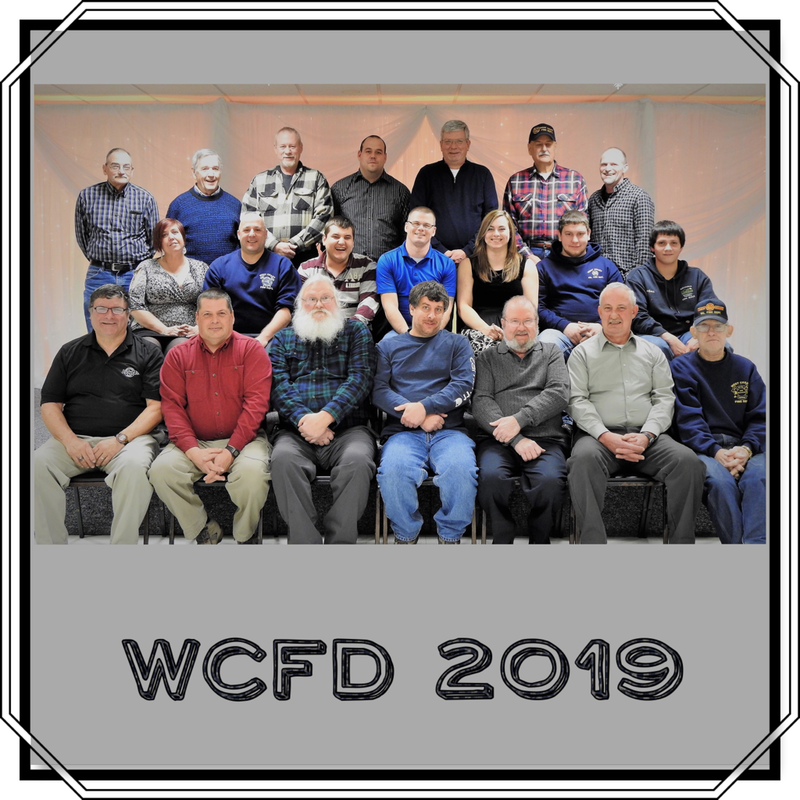 On May 24th, 1949 the West Chazy Fire Department was formed. Down through the years, Mr. Robinson was always foremost in suggesting improvements to the existing fire equipment and on March 10, 1962 he donated 600 shares of Celanese stock to the fire district which when sold, placed in the hands of the commissioners $25,658.51 A tract of land 14 acres in extent on the east side of Route 22 south of the four corners of the village was purchased from Mrs. Eleanor Coupal and a new fire house was designed and built by Robert Christensen of West Chazy. The firehouse was built during August through September of 1963 and officially dedicated by Mr. Robinson when he cut the ceremonial ribbon and placed the fire house in commission. It was constructed of brick and cinder block, 40' by 80' in size. On the south end there were four bays for fire equipment and on the north end there was a meeting room and kitchen. To add to his very generous gift, Mr. Robinson purchased and donated to the district a Pontiac ambulance the very next year. This vehicle was heavily utilized as years passed by. The land to the rear of the fire house was developed by the volunteer firemen and dedicated as the L.G Robinson Memorial Field after Mr. Robinson's passing away. The land was grated and seeded and a backstop was erected. For the first time in history, the village had a real high class baseball and recreation field where all the Little League Teams and the Fire Department softball team could play. Later on, a more extensive development of the land was completed thus a community park and playground is now available for use. Disaster struck on December 29,1970 when in the middle of the night the fire house was discovered to be enveloped in flames. From the minute of the first alarm, it was know that the fire was so advanced that the building was beyond any chance of saving even though several neighboring Fire Depts. struggled valiantly to do so. Lost was the beautiful firehouse that Mr. Robinson was so proud of and into which he poured so much energy and financial resources. Also lost was a 1963 fire truck a 1949 fire truck and the ambulance which had served the community so well for six years. In less than 24 hours, the Fire Department was back in business having relocated to a loaned garage which made an excellent temporary fire house. A 1955 fire truck was generously loaned to the district by the Morrisonville Fire District. An ambulance was purchased and equipped by the fire dept and a squad car was to be delivered a short time thereafter. That piece of equipment had been on order previous to the fire.